Anti-Wasp from Perfectly Natural Solutions is an anti-wasp spray based on essential oils for preventative use on clothing and skin to help prevent wasps stinging. The "Anti" product range from Perfect Natural Solutions are based on essential oils as active ingredients, and contain no DEET, citronella or pyrethrin. This makes the product a natural and safe deterrent to flying insects including mosquitoes, horse flies, ticks and wasps. The products are suitable for dogs, horses and other hoofed animals, but also for humans! 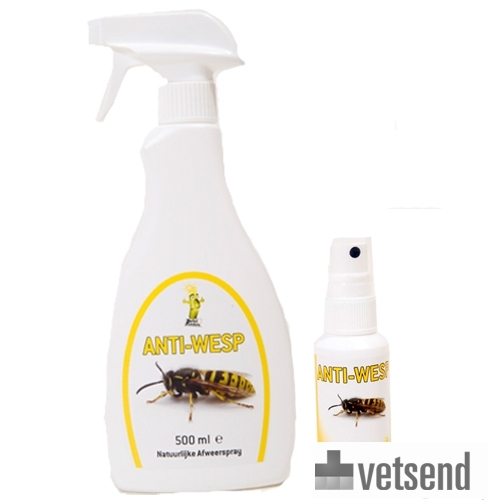 Anti-Wasp is based on natural essential oils to keep wasps away effectively and to prevent potentially dangerous and painful wasp stings. Ideal for walks through the forest, outdoor events and in the garden. Spray evenly on the animal and/or yourself from a distance of 50 cm. Repeat daily. If necessary, Anti-Wasp can be used several times a day. Also very suitable for furniture, bins, tables, etc. The duration of the protection is affected by rain, sweat and hygiene. Water will reduce effectiveness of the product. Water, alcohol, solvents, lavender oil. Anti-Wasp is registered with the CTGB (College for the Authorisation of Plant Protection Products and Biocides) and approved by the Dutch Ministry of Housing, Spatial Planning and the Environment (VROM). Have you used Perfect Natural Solutions Anti-Wasp before? Let us know what you think about this product.